The Foundation for Belmont Education (FBE) is a private, non-profit organization dedicated to making a difference in the Belmont Public Schools. While the Foundation cannot substitute for public support of education through tax dollars, the funds it raises from events such as the Spelling Bee, the Dan Scharfman Memorial Run, and the Spring Dinner play a pivotal role in fostering the creativity of our teachers, engaging the interest of our students, and sustaining the tradition of excellence that has characterized the Belmont Public Schools for so many years. What is the FBE Spelling Bee? 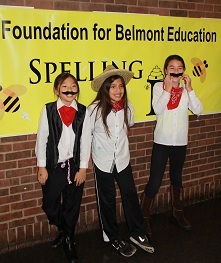 The Spelling Bee is a spelling demonstration and competition to benefit the Foundation for Belmont Education (FBE). This year marks the 18th annual FBE Spelling Bee for Kindergarten through Sixth grade spellers. The Kindergarten through Fourth grade teams are divided into non-competitive ’swarms’ (rounds of teams). Each non-competitive team is made up of three to four spellers. The Fifth and Sixth grade swarms are competitive, and are made up of three to four spellers per team. How do I register for the FBE Spelling Bee? Your child should join or form a team of student spellers amongst Belmont friends or school classmates. An adult should then go online to the FBE website www.fbe-belmont.org/bee to complete their child’s registration, including a registration fee payment of $30/speller. Each participant will need to be registered individually. Please fill in your child’s team name, team name, and names of each team member in the space provided on the online form. Scholarships are available to help cover the registration fee. Please contact your school guidance counselor or beemaster@fbe-belmont.org for information. My team hasn’t chosen a name yet, can I still register? You may not register a participant without entering a team name. Please encourage children to select a team name before individuals register. When and where is the FBE Spelling Bee? The Spelling Bee will take place on Saturday, November 3, 2018 (from 2:00 p.m. until approximately 8:00+ p.m.) at the Chenery Middle School Auditorium located at 95 Washington Street, Belmont. Teams in the Grades 5-6 competitive swarms are expected to stay in the auditorium until elimination or the final round of the FBE Spelling Bee. Teams in the non-competitive K-4 swarms are expected to be present only for their specific swarm Arrival Time and Stage Time. However, we encourage and welcome K-4 participants and their guests to watch other swarms before and after their own. How do I find out when we should arrive at the FBE Spelling Bee? Each team of spellers will be assigned to a specific swarm. Your swarm assignment and swarm Line Up Time will be posted on the FBE website a few days prior to the Bee, so that you can find your child’s team and plan accordingly. The Line Up Time is 15 minutes before your child will actually be on the Chenery Middle School auditorium stage to spell. What are the expected swarm times by grade? Teams in the competitive swarms are expected to stay in the auditorium until elimination or the final round of the FBE Spelling Bee. Prizes will be awarded to the first and second place teams from the competitive swarms at the end of the evening. The FBE Spelling Bee is a great opportunity to bring old friends together and reach out to new ones. Most spellers start by asking classmates to form a team; but please remember, teams do not have to come from the same class, the same grade, or even the same school. Friends from sports teams or afterschool activities are also potential teammates. Your classroom teacher may know of other students who are interested in participating and be able to help you connect with teammates as well. Can I enter by myself, or do I have to have a team? My team has five members. What do I do? We have found that three to four members is the ideal size for teams. It allows the spellers to gather around the table and whiteboard and work together most effectively. We will, however, allow teams of five in the non-competitive K-4 division. If you have a team of five, you may want to consider finding another speller and creating two teams of three. Please note, we cannot allow teams larger than four in the competitive Grade 5 & 6 swarms. Can my team have members from different grades? Yes, your team can have members from different grades. However, your team must study the word list for the speller(s) in the highest grade on your team. For example, if you have a 2nd and 3rd grader on the same team, the team will spell in a Grade 3 & 4 swarm using the Grade 3 & 4 word list. For the Competitive Swarms, all team members must be in either Grade 5 or 6. Are there restrictions around the selection of a team name? The Spelling Bee is intended to be a fun and inclusive event for all spellers, their families, and friends. In the spirit of the event, team names may not evoke violence, make others feel uncomfortable, or be in any way offensive. The Spelling Bee Chairs reserve the right to request that a team change its name. How do I prepare for the FBE Spelling Bee? Word lists and FBE Spelling Bee rules will be available online at our website. The Grade K-4 swarms are non-competitive, and word lists are age-appropriate. Many teams choose to split up the list so each child is an ’expert’ on one sub-set of words. We also encourage teams to dress alike, dress in costume or wear team-designed shirts, so have fun and Bee creative! You are also welcome to re-utilize your child’s Halloween costume in team spirit or dress! Will the 5th and 6th Grade Swarms only use the word list? No. Because this is competitive with prizes awarded to the first and second place teams from the final competitive round, the pronouncers will start with words from the wordlist but will move off-list as the competition progresses. It is amazing what talented spellers live in Belmont! What do I do once I arrive at Chenery Middle School? Please park in the Chenery Middle School parking lot or neighborhood streets and enter the building through the cafeteria doors facing the parking lot. Spellers can be dropped off in the swarm line-up area hallway and adults can then proceed to the auditorium to watch the Bee. Each K-4 swarm will be escorted onto the stage by an FBE volunteer, spell for approximately 15 minutes, and then be led off the stage as one group. Grade 5-6 swarms are competitive so the amount of time they are on stage will vary. Volunteers will be stationed throughout the building to point spellers and Spelling Bee observers to the right place. Please stop at the FBE Welcome Table should you have any questions or need assistance. We have more than one child participating in the FBE Spelling Bee. What is there to do between swarms? There will be pizza, snacks and drinks for sale in the cafeteria, along with tables to do word puzzles and color. Also, the FBE Spelling Bee mascot will return again this year! We encourage you to bring your camera and take your child’s photo with The Bee! Please follow the signs to the photo-op area in the hallway. It is also fun to watch other swarms, friends, neighbors, and classmates, spell on stage while you wait for your child’s swarm time. Who should I contact if I have trouble registering? If you have questions about your registration, please contact Alina Lisanke & Kim Foster at beekeeper@fbe-belmont.org. Can the Spelling Bee sell out? Due to the growing popularity of the Spelling Bee, and the size limitations of the venue, we anticipate that this event will sell out. Registration may sell out before the official closing date. If regular registration is sold out, we will have limited tickets available for new spellers to join existing teams. Once the event is sold out we will not be able to add your speller even if his/her teammates have already registered, so please register early and remind your teammates to sign up as well. We will do our best to accommodate all spellers who wish to participate! If you have additional questions, please direct them to the Spelling Bee Co-Chair at beemaster@fbe-belmont.org> beemaster@fbe-belmont.org. Thank you and we look forward to seeing you at the 2018 FBE Spelling Bee!